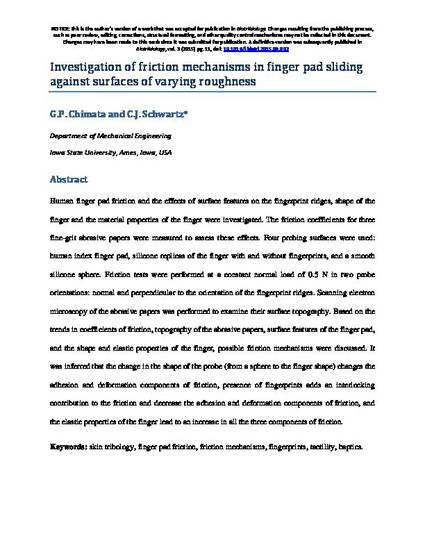 Human finger pad friction and the effects of surface features on the fingerprint ridges, shape of the finger and the material properties of the finger were investigated. The friction coefficients for three fine-grit abrasive papers were measured to assess these effects. Four probing surfaces were used: human index finger pad, silicone replicas of the finger with and without fingerprints, and a smooth silicone sphere. Friction tests were performed at a constant normal load of 0.5 N in two probe orientations: normal and perpendicular to the orientation of the fingerprint ridges. Scanning electron microscopy of the abrasive papers was performed to examine their surface topography. Based on the trends in coefficients of friction, topography of the abrasive papers, surface features of the finger pad, and the shape and elastic properties of the finger, possible friction mechanisms were discussed. It was inferred that the change in the shape of the probe (from a sphere to the finger shape) changes the adhesion and deformation components of friction, the presence of fingerprints adds an interlocking contribution to the friction and decrease the adhesion and deformation components of friction, and the elastic properties of the finger lead to an increase in all the three components of friction. This is an open access article distributed under the Creative Commons BY-NC-ND License.